In a city full of different cultures, it is no surprise we have our fair share of fusion restaurants. Of course, the word "fusion" itself is polarizing. You have the purists crying foul while some don't really care about authenticity. For me, if it tastes good, I don't really care who made it and what cuisine the food is supposed to resemble. Okay, so fusion is supposed to represent the combination of 2 or more cuisines into one. So what do we call a restaurant that serves 2 cuisines independent of each other? The last time I encountered this was Crystal Elephant Range in North Delta. They do Thai as well as Italian food. A strange marriage of cuisines for sure. Imag ine my reaction to Indo Mexicana while I was driving up North Road... Indian and Mexican? I was hesitant. However, someone emailed me urging me to try it. Oh fine, why not. 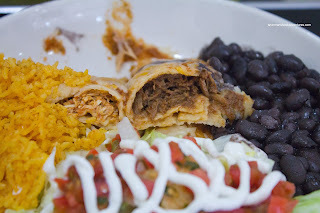 I gathered up Big D, Slick and Red Light for a food adventure in New West. In a way, I was disappointed that they didn't try to fuse both cuisines. A butter chicken burrito would've been tasty in my books. 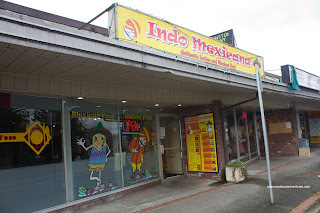 However, they really do only serve Indian and Mexican food independently of each other. I decided to get the Combo which included a choice of 3 items from the Indian menu (also included choice of naan or rice). I went for Butter Chicken, Shahi Paneer and Chicken Curry. The Butter Chicken wasn't exactly creamy nor was it heavy on the tomato paste either. It had a nice spice and certainly wasn't bland, but was a touch salty though. The Shahi Paneer was probably my favourite of the bunch with big fried pieces of cheese in a spicy and sweet sauce. The Chicken Curry was also quite tasty with plenty of depth and definitive spiciness. There was good hits of coriander and ginger. However, the big chicken thigh was a bit clumsy to eat. As for the Naan, it was not even remotely close to the real thing. It was more like pita bread. I guess with no tandoor on site, that was expected. Red Light and Slick both had the combo as well. 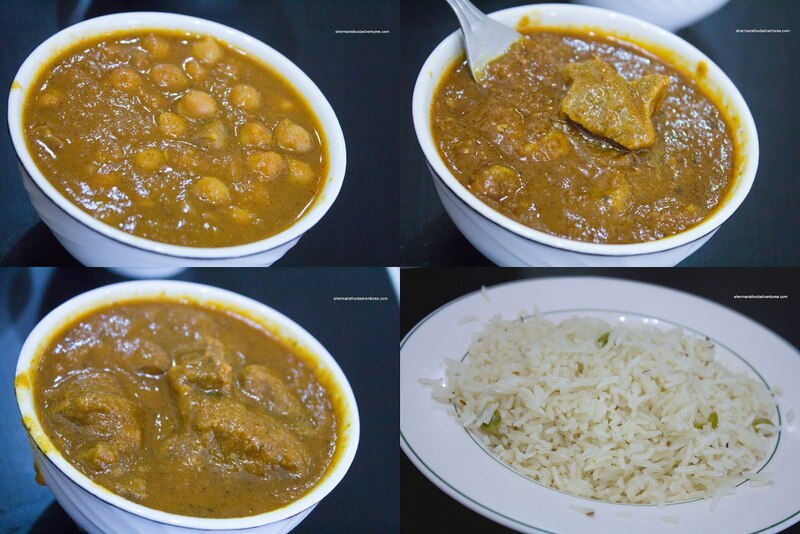 The non-duplicated dishes were the Chickpea Curry, Lamb Curry and Beef Curry. Honestly, there was little difference in the flavour of all 3 except for the main ingredient. 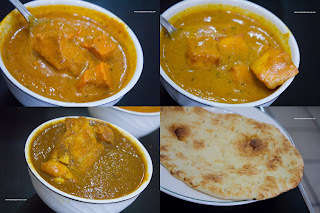 They resembled the chicken curry (beef was a bit chewy as with the lamb). Big D took one for the team and ordered the sole Mexican item at the table. 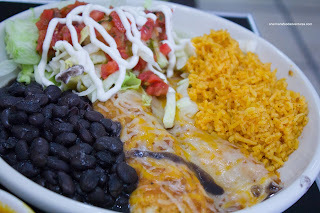 He went for the Enchiladas (one beef and one chicken). I'm sorry to say that these were pretty sad. The meat inside was soggy and cold. It seemed like they were cooked from frozen. I must give them props for using real shredded beef rather than ground though. The mediocre enchilada withstanding, the Indian food was actually quite decent. We liked how they didn't let up on the spice which in turn made the curries flavourful. Sure, the food ain't gonna win any awards (especially the Mexican), however with reasonable pricing and good portions, the lunch crowd will continue to fill the restaurant. New York subway in Toronto has Indian style burritos, like your buyer chicken burrito. 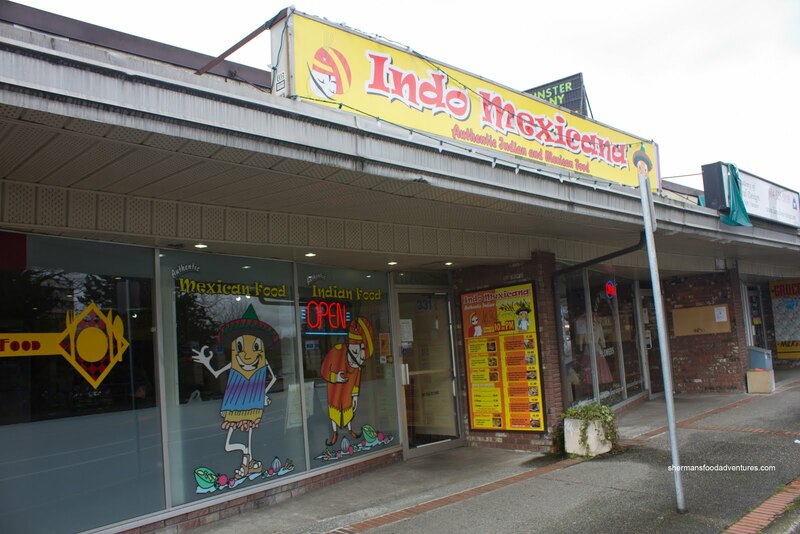 Looks like they're 95% Indian food, 5% Mexican ? Another unique fusion-y place in GTA is Duffin's Donuts at 41/Knight ....... tortas, banh mi, burgers, sandwiches, fried chicken, tamales, pupusas, Chinese food, bubble tea.